I wanted to share with you a quick little mod podge pumpkin I did today. Basically, I found some scrap material that I had laying around, some ribbon, and some flower embellishments. I first Cut the material in strips of all sizes and just started mod podging the pumkin then adhering the material and mod podging over the material. My project is still wet. You know, I am such a patient person. I can’t wait to really start decorating. This was my first pumpkin of the season! That is too cute! 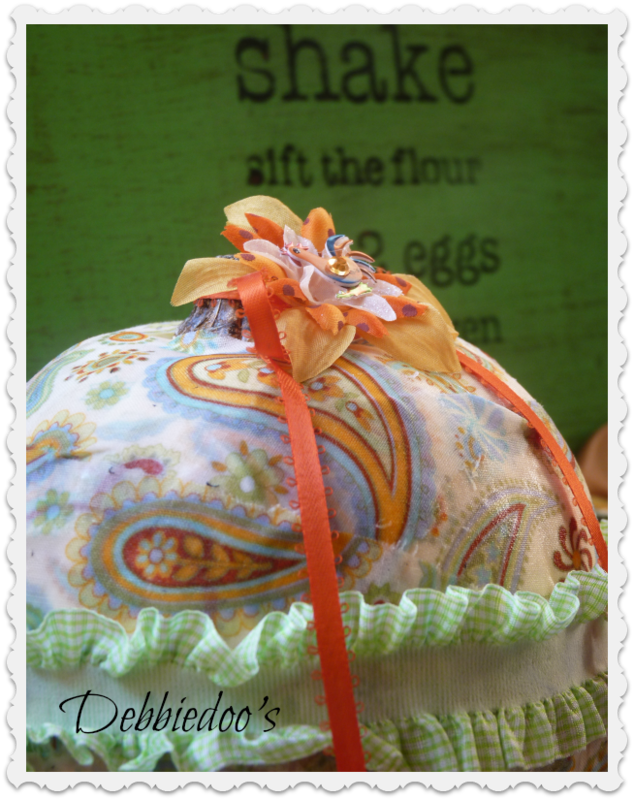 I am getting excited about getting out fall stuff! I just found my tubs so I am in business!! That is so cute! I’ll have to see if I can come up with an idea to primp a pumpkin. Never primped a pumpkin before, might have to give it some thought. Your little pumpkin is so pretty! It’s a “country pumpkin”! So cute. I looooove the paisley fabric. Super cute. Your pumpkin looks so pretty! 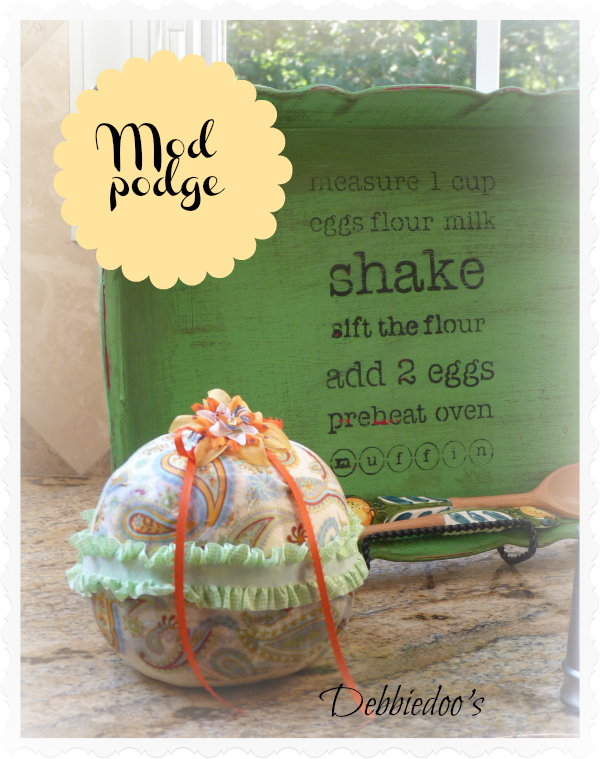 Let me tell you, I was not born to use mod podge! LOL My daughter and I tried to do this over the weekend for the first time, to display them in a basket, and they came out sooo ugly, we just had to throw them away! LOL What is the secret? It looks like such an easy project! Not sure what the secret is. I first mod podged the section of the pumpkin and layered the material and mod podged over that several times. Love that “Debbie Style” pumpkin. what a beautiful pumpkin, this is so cool, so much fun, I’m making a velvet pumpkin today, I’m always so far behind in the trends, ha ha, but I get there eventually!! Cute pumpkin Love your fall header! I need to decorate and do my fall header….just back from vacay and in a fog! Have a wonderful day! I love your girly pumpkin, Debbie! The party sounds like fun. I will try to create some fun pumpkins! You know I’m ready for this one! I was thinking I could Mod Podge a nose on my punkin’s noggin, he doesn’t have one. Or give him some fabric like yours? 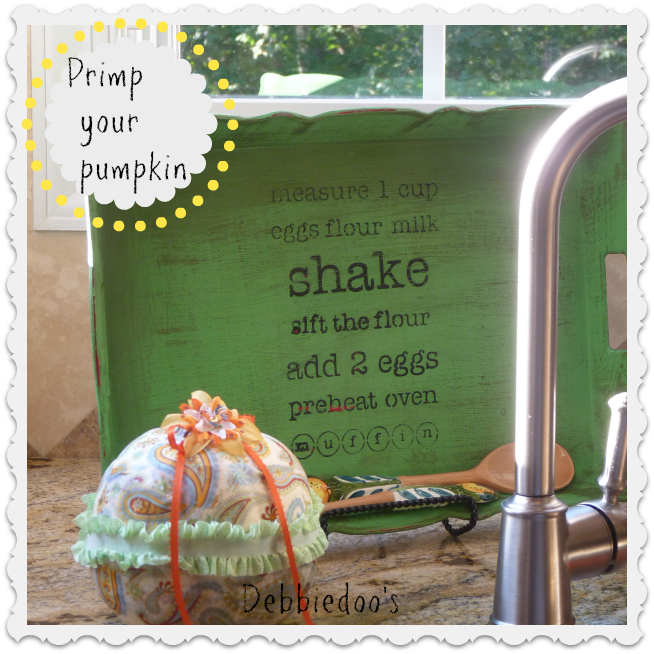 Primp your pumpkin! That is so funny! I had to read it twice, because I thought it said something else!!! CUTE. I saw pumpkins in the market yesterday for the first time. I didn’t buy one just yet though. Soon. Too cute Debbie! I am so excited to primp my pumpkins! Cute, cute! I have an idea of what I’d like to do with a pumpkin….just want to find the time. Lots going on and weekend is already full. Looking forward to seeing what everyone comes up with! Who can resist your muffin pumpkin, Debbie? Calorie free, beautiful, hubby can’t eat the last one…perfect! Your pumpkin has muffin top! Primped my pumpkin today – it’s awaiting it’s debut at your party! I love it! I need to use more Mod Podge 🙂 Can’t wait to party with y’all! If I can squeeze in the time I would love to primp a pumpkin. Anyway, I don’t do one myself it will be fund to see what everyone else comes up with. Fun idea! This is such a great idea for a party. Count me in… LOve this. I have three funkins I am hopefully primping this weekend! What a fun party!